Your cell phone provider tracks your location and knows whoâs with you. Your online and in-store purchasing patterns are recorded, and reveal if you're unemployed, sick, or pregnant. Your e-mails and texts expose your intimate and casual friends. Google knows what youâre thinking because it saves your private searches. Facebook can determine your sexual orientation without you ever mentioning it. The powers that surveil us do more than simply store this information. Corporations use surveillance to manipulate not only the news articles and advertisements we each see, but also the prices weâre offered. Governments use surveillance to discriminate, censor, chill free speech, and put people in danger worldwide. And both sides share this information with each other or, even worse, lose it to cybercriminals in huge data breaches. Much of this is voluntary: we cooperate with corporate surveillance because it promises us convenience, and we submit to government surveillance because it promises us protection. The result is a mass surveillance society of our own making. But have we given up more than weâve gained? 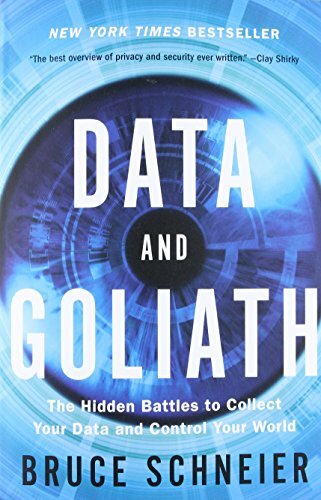 In Data and Goliath, security expert Bruce Schneier offers another path, one that values both security and privacy. He brings his bestseller up-to-date with a new preface covering the latest developments, and then shows us exactly what we can do to reform government surveillance programs, shake up surveillance-based business models, and protect our individual privacy. You'll never look at your phone, your computer, your credit cards, or even your car in the same way again. About: You are under surveillance right now. About: “Bruce Schneier’s amazing book is the best overview of privacy and security ever written. With Michelle Reid | from Harlequin Books (October 1, 2001); titled "The Unforgettable Husband"
About: For a year, Samantha had been suffering from amnesia.